Kathryn R. Fingar, Ph.D., M.P.H., Iris Mabry-Hernandez, M.D., M.P.H., Quyen Ngo-Metzger, M.D., M.P.H., Tracy Wolff, M.D., M.P.H., Claudia A. Steiner, M.D., M.P.H., and Anne Elixhauser, Ph.D. This Healthcare Cost and Utilization Project (HCUP) Statistical Brief presents data on the prevalence of preeclampsia/eclampsia among inpatient delivery hospitalizations in 2014. The Brief describes trends in the rate of preeclampsia/eclampsia from 2005 through 2014, overall and by patient and hospital characteristics. Characteristics of deliveries with preeclampsia/eclampsia are examined in 2014. Delivery hospitalizations represent the hospital stay for the mother and not the infant. Descriptions of infant outcomes are those conditions that appear on the maternal record. All differences between estimates noted in the text are 10 percent or greater. In 2014, almost 5 percent of all inpatient deliveries involved preeclampsia/eclampsia—a 21 percent increase from 2005. Of the nearly 177,000 deliveries with the condition in 2014, 1 percent had eclampsia, 37 percent had severe preeclampsia, 47 percent had mild/unspecified preeclampsia, and 15 percent had preeclampsia/eclampsia with preexisting hypertension. For black women, the rate of preeclampsia/eclampsia was 70 per 1,000 deliveries in 2014—60 percent higher than for white women (43 per 1,000). The condition was less severe among white women than among black women. Over half of white women with the condition had mild/unspecified preeclampsia, compared with 37 percent of black women. Compared with other deliveries, a higher percentage of those with preeclampsia/eclampsia were among women who were the youngest, the oldest, black, and from the poorest areas and the South. Compared with other deliveries, mean length and cost of stays with preeclampsia/eclampsia were 70 percent higher. Procedural interventions (such as cesarean section, blood transfusion, hysterectomy, ventilation) were more common among deliveries with preeclampsia/eclampsia than among other deliveries, as were severe obstetric morbidities (such as renal failure) and poor infant outcomes. The left side of Figure 1 displays all delivery hospitalizations in 2014 by presence of preeclampsia/eclampsia as well as other hypertension-related diagnoses complicating pregnancy, childbirth, and the puerperium. The right side of Figure 1 displays the subset of delivery hospitalizations with a diagnosis of preeclampsia/eclampsia in 2014 by type of preeclampsia/eclampsia diagnosis. a Records with ICD-9-CM diagnosis code 642.7, which indicates that preeclampsia or eclampsia was present with preexisting hypertension but does not specify the severity of the condition. b Preexisting hypertension without preeclampsia or eclampsia. Figure 1 is two pie charts, one showing the distribution of all delivery hospitalizations with and without hypertension-related diagnoses and the other showing the distribution of deliveries by type of preeclamsia/eclampsia. Total delivery hospitalizations: 3,796,490; no hypertension: 3,386,995, 89.2%; preeclampsia, eclampsia: 176,925, 4.7%; pre-existing hypertension: 63,920, 1.7%; gestational hypertension: 145,720, 3.8%; unspecified hypertension: 22,930, 0.6%. Total deliveries with preeclampsia/eclampsia: 176,925; mild or unspecified preeclampsia: 82,910, 46.9%; severe preeclampsia: 65,880, 37.2%; preeclampsia/eclampsia with pre-existing hypertension: 25,625, 14.5%; eclampsia: 2,510, 1.4%. In 2014, more than 1 in 10 delivery hospitalizations had a diagnosis of hypertension. Among these deliveries with any hypertension-related diagnosis, preeclampsia/eclampsia was the most common. In 2014, 409,495 delivery hospitalizations had a diagnosis of hypertension complicating pregnancy, childbirth, and the puerperium, representing 10.8 percent of 3.8 million total deliveries. Preeclampsia/eclampsia was the most common type of hypertension-related diagnosis (4.7 percent), followed by gestational hypertension (3.8 percent), preexisting hypertension (1.7 percent), and unspecified hypertension (0.6 percent). In 2014, of all delivery hospitalizations with a diagnosis of preeclampsia/eclampsia, over one-third had severe preeclampsia. In 2014, 176,925 delivery hospitalizations had a diagnosis of preeclampsia/eclampsia, representing 4.7 percent of 3.8 million total deliveries. Although the most severe form of the condition (eclampsia) was rare (1.4 percent), an additional 37.2 percent of deliveries with any diagnosis of preeclampsia/eclampsia had severe preeclampsia. Nearly half of deliveries with preeclampsia/eclampsia had mild or unspecified preeclampsia (46.9 percent), and 14.5 percent had preeclampsia/eclampsia with preexisting hypertension but lacked detail on the severity of the condition. In addition to the deliveries shown in Figure 1, in 2014 there were 21,180 hospitalizations during or after pregnancy involving preeclampsia/eclampsia, in which the hospital stay did not result in delivery (data not shown). Although this Brief focuses on delivery hospitalizations, these antepartum and postpartum stays contribute to the total burden of preeclampsia/eclampsia in the inpatient hospital setting. Table 1 compares patient and hospital characteristics among deliveries with preeclampsia/eclampsia with all other deliveries in 2014. Compared with all other deliveries, those with preeclampsia/eclampsia were more likely to be among women in the youngest and oldest age categories, black women, women from the poorest areas, and women who delivered in the South. Overall, deliveries with preeclampsia/eclampsia were more likely than all other deliveries to be among women in the youngest and oldest age groups (8.2 vs. 6.4 percent among patients aged less than 20 years; 18.9 vs. 15.4 percent among women aged 35 years or older) and to be among black women (20.1 vs. 13.1 percent). In addition, preeclampsia/eclampsia was more common among women who resided in the poorest areas (31.9 vs. 27.7 percent in income quartile 1) and those who delivered in the South (42.6 vs. 38.3 percent). The mean length of stay and hospital costs were over 70 percent higher for deliveries with preeclampsia/eclampsia, compared with all other deliveries. The mean length of stay was 71 percent higher for deliveries with preeclampsia/eclampsia compared with all other deliveries (4.4 vs. 2.6 days). The average hospital cost per stay was 70 percent higher for deliveries with preeclampsia/eclampsia compared with all other deliveries ($7,500 vs. $4,400). There were differences in patient age and race/ethnicity across the types of preeclampsia/eclampsia. Of deliveries with eclampsia, 21.3 percent were among teens. In comparison, less than 10 percent of deliveries with other diagnoses for severe preeclampsia or mild preeclampsia were among teens. Only 6.4 percent of all other deliveries without a diagnosis of preeclampsia/eclampsia were in this age group. Nearly 1 in 3 deliveries (31.3 percent) with a diagnosis of preeclampsia/eclampsia with preexisting hypertension were among black women. In comparison, only 13.1 percent of all other deliveries were among black women. Deliveries involving preeclampsia/eclampsia with preexisting hypertension were associated with longer hospital stays. Hospital stays for more severe forms of preeclampsia/eclampsia were more expensive than the mild or unspecified type. The mean length of stay was highest for deliveries with a diagnosis of preeclampsia/eclampsia with preexisting hypertension (5.4 days compared with 4.8 days or fewer among deliveries with other preeclampsia/eclampsia diagnoses). The average hospital cost per stay was lower for deliveries with mild or unspecified preeclampsia ($6,300) than for deliveries with the other preeclampsia/eclampsia diagnoses ($8,500-$9,000). Figure 2 displays the rate of preeclampsia/eclampsia per 1,000 deliveries by type of diagnosis from 2005 through 2014. 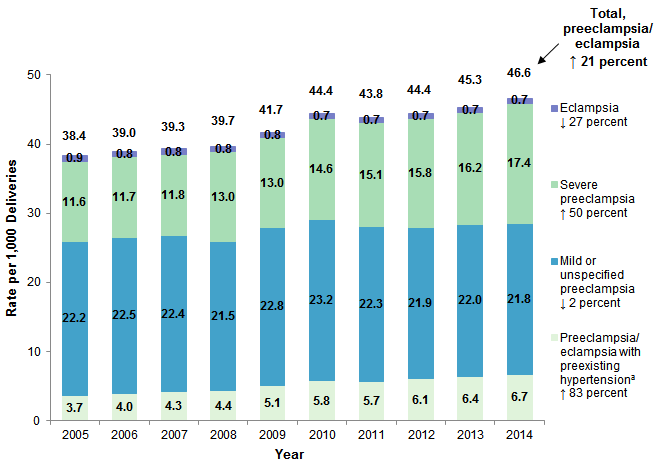 Figure 2 is a bar chart that shows the rate of preclampsia/eclampsia per 1,000 delivery hospitalizations by diagnosis type from 2005 through 2014. 2005: total, 38.4; preeclampsia/eclampsia with pre-existing hypertension, 3.7; mild or unspecified preeclampsia, 22.2; severe preeclampsia, 11.6; eclampsia, 0.9. 2006: total, 39.0; preeclampsia/eclampsia with pre-existing hypertension, 4.0; mild or unspecified preeclampsia, 22.5; severe preeclampsia, 11.7; eclampsia, 0.8. 2007: total, 39.3; preeclampsia/eclampsia with pre-existing hypertension, 4.3; mild or unspecified preeclampsia, 22.4; severe preeclampsia, 11.8; eclampsia, 0.8. 2008: total, 39.7; preeclampsia/eclampsia with pre-existing hypertension, 4.4; mild or unspecified preeclampsia, 21.5; severe preeclampsia, 13.0; eclampsia, 0.8. 2009: total, 41.7; preeclampsia/eclampsia with pre-existing hypertension, 5.1; mild or unspecified preeclampsia, 22.8; severe preeclampsia, 13.0; eclampsia, 0.8. 2010: total, 44.4; preeclampsia/eclampsia with pre-existing hypertension, 5.8; mild or unspecified preeclampsia, 23.2; severe preeclampsia, 14.6; eclampsia, 0.7. 2011: total, 43.8; preeclampsia/eclampsia with pre-existing hypertension, 5.7; mild or unspecified preeclampsia, 22.3; severe preeclampsia, 15.1; eclampsia, 0.7. 2012: total, 44.4; preeclampsia/eclampsia with pre-existing hypertension, 6.1; mild or unspecified preeclampsia, 21.9; severe preeclampsia, 15.8; eclampsia, 0.7. 2013: total, 45.3; preeclampsia/eclampsia with pre-existing hypertension, 6.4; mild or unspecified preeclampsia, 22.0; severe preeclampsia, 16.2; eclampsia, 0.7. 2014: total, 46.6; preeclampsia/eclampsia with pre-existing hypertension, 6.7; mild or unspecified preeclampsia, 21.8; severe preeclampsia, 17.4; eclampsia, 0.7. Percent change: total, +21%; preeclampsia/eclampsia with pre-existing hypertension, +83%; mild or unspecified preeclampsia, -2%; severe preeclampsia, +50%; eclampsia, -27%. From 2005 through 2014, the total rate of preeclampsia/eclampsia among delivery hospitalizations increased by 21 percent. The total rate of preeclampsia/eclampsia increased from 38.4 per 1,000 deliveries in 2005 to 46.6 per 1,000 deliveries in 2014, an increase of 21 percent. The largest increases were for deliveries with preeclampsia/eclampsia with preexisting hypertension (which increased by 83 percent, from 3.7 to 6.7 per 1,000 deliveries) and deliveries with severe preeclampsia (which increased by 50 percent over the 10-year span, from 11.6 to 17.4 per 1,000 deliveries). Although rare, the rate of eclampsia decreased by 27 percent from 2005 through 2014. From 2005 through 2014, the rate of eclampsia decreased from 0.9 to 0.7 per 1,000 deliveries, a decrease of 27 percent. Deliveries with mild or unspecified preeclampsia remained stable at around 22 per 1,000 deliveries. Table 2 presents the total rate of preeclampsia/eclampsia per 1,000 deliveries in 2005 and 2014, by patient and hospital characteristics. a Other payers are not shown. The rate of preeclampsia/eclampsia was highest among women in the oldest and youngest age groups in both 2005 and 2014, but the rate increased most rapidly among women aged 35 years or older. In 2005 and 2014, the rate of preeclampsia/eclampsia was highest among women younger than 20 years and women aged 40 years or older (59.3 and 73.5 per 1,000 deliveries, respectively, in 2014). From 2005 to 2014, the rate increased the most among women aged 35-39 years and 40 years and older (each with a 36 percent increase). The rate among women younger than 20 years increased by only 14 percent, the smallest increase of any age group. The rate of preeclampsia/eclampsia was higher among deliveries paid by Medicaid than among those paid by private insurance, but the rate increased more over time among deliveries paid by private insurance. Medicaid and private insurance paid for the vast majority of deliveries. In 2005, the rate of preeclampsia/eclampsia was 15 percent higher among deliveries paid by Medicaid than among those paid by private insurance (41.2 vs. 35.8 per 1,000 deliveries). In 2014, this difference decreased (49.0 vs. 45.1 per 1,000 deliveries), reflecting a 19 percent increase in the rate of preeclampsia/eclampsia among deliveries with Medicaid versus a 26 percent increase in the rate among deliveries with private insurance. Although Medicare paid for relatively fewer deliveries compared with the other payers, the rate of preeclampsia/eclampsia was highest among women with Medicare (53.4 per 1,000 deliveries in 2005 and 63.9 per 1,000 deliveries in 2014). The rate of preeclampsia/eclampsia was highest among women who resided in the poorest areas, but the rate rose more among those from the wealthiest areas. In both 2005 and 2014, the rate of preeclampsia/eclampsia was highest among women who resided in the poorest ZIP Codes (income quartile 1). During this time period, the rate increased from 44.3 to 53.2 per 1,000 deliveries among women in these areas—an increase of 20 percent. In comparison, the rate was 30.8 per 1,000 deliveries among women who resided in the wealthiest ZIP Codes (income quartile 4) in 2005 but increased by 28 percent to 39.4 per 1,000 deliveries in 2014. The rate of preeclampsia/eclampsia was highest among women who resided in nonmetropolitan areas, but the rate rose more among those from metropolitan areas. The rate of preeclampsia/eclampsia was highest among women who resided in micropolitan and rural areas in 2005 (43-44 per 1,000 deliveries) and rose by 12 percent (to 48-49 per 1,000 deliveries in 2014). In comparison, in large and small metropolitan areas, the rate of preeclampsia/eclampsia was 37-38 per 1,000 deliveries in 2005 and increased by 23 percent to 46-47 per 1,000 deliveries in 2014. The rate of preeclampsia/eclampsia was highest among women in the South, but the rate rose most rapidly in the Northeast. In both 2005 and 2014, the rate of preeclampsia/eclampsia was highest among deliveries in the South (43.1 and 51.6 per 1,000 deliveries, respectively). The rate of preeclampsia/eclampsia rose across all regions from 2005 through 2014. However, the increase was largest among deliveries in the Northeast, where the rate rose by 30 percent from 34.6 to 45.0 per 1,000 deliveries. Figure 3 presents the rate of preeclampsia/eclampsia per 1,000 deliveries in 2014, by race/ethnicity and type of diagnosis. Notes: Trends by race/ethnicity are not shown because in 2005 a number of States did not contribute data on race/ethnicity, resulting in 26 percent of records with missing data. By 2014, the percentage of delivery records with missing data on race/ethnicity was only 6 percent. "Other" and missing races/ethnicities are not shown. 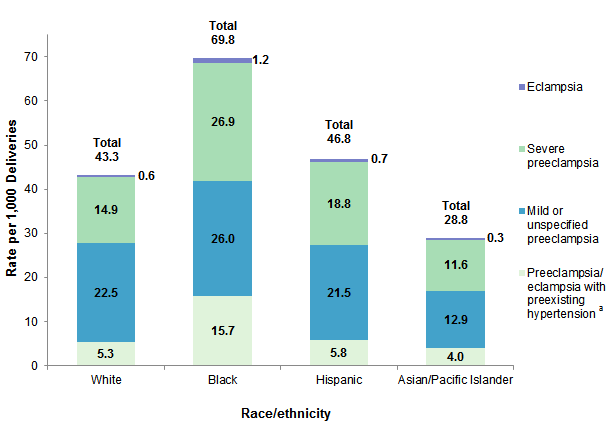 Figure 3 is a bar chart that shows the rate of preeclampsia per 1,000 deliveries by race/ethnicity and diagnosis type in 2014. White: total, 43.3; preeclampsia/eclampsia with pre-existing hypertension, 5.3; mild or unspecified preeclampsia, 22.5; severe preeclampsia, 14.9; eclampsia, 0.6. Black: total, 69.8; preeclampsia/eclampsia with pre-existing hypertension, 15.7; mild or unspecified preeclampsia, 26.0; severe preeclampsia, 26.9; eclampsia, 1.2. Hispanic: total, 46.8; preeclampsia/eclampsia with pre-existing hypertension, 5.8; mild or unspecified preeclampsia, 21.5; severe preeclampsia, 18.8; eclampsia, 0.7. Asian/Pacific Islander: total, 28.8; preeclampsia/eclampsia with pre-existing hypertension, 4.0; mild or unspecified preeclampsia, 12.9; severe preeclampsia, 11.6; eclampsia, 0.3. In 2014, the rate of preeclampsia/eclampsia was at least 50 percent higher among black women than among women of any other racial/ethnic group. In 2014, the total rate of preeclampsia/eclampsia was higher among black women than among women of other racial/ethnic groups. The total rate of preeclampsia/eclampsia was 69.8 per 1,000 deliveries among black women—about 60 percent higher than the rate among white women (43.3 per 1,000 deliveries). In 2014, there was no substantial difference in the total rate of preeclampsia/eclampsia between white women and Hispanic women (43.3 vs. 46.8 per 1,000 deliveries). Asian/Pacific Islanders had the lowest total rate of preeclampsia/eclampsia of any racial/ethnic group (28.8 per 1,000 deliveries). Table 3 examines each type of preeclampsia/eclampsia as a percentage of total deliveries with any preeclampsia/eclampsia by race/ethnicity. Among women with preeclampsia/eclampsia, black women were more likely than women of other races/ethnicities to have a more severe diagnosis. The rate of each type of preeclampsia/eclampsia diagnosis was higher among black women than among women of other races/ethnicities (Figure 3). When the rate for each type of preeclampsia/eclampsia was examined as a percentage of the total rate for any preeclampsia/eclampsia, black women were more likely than other women to have a more severe diagnosis. Among women with preeclampsia/eclampsia, the percentage with a diagnosis of preeclampsia/eclampsia with preexisting hypertension (which does not distinguish between severe and mild cases of the condition) was much greater for black women than for white women (22.5 vs. 12.3 percent), as was the percentage with eclampsia (1.7 vs. 1.4 percent) and severe preeclampsia (38.5 vs. 34.3 percent). At the same time, the percentage with mild or unspecified preeclampsia was much lower among black women than among white women (37.3 vs. 51.9 percent). The percentage of women with mild or unspecified preeclampsia was also lower for Hispanic and Asian/Pacific Islander women compared with white women (45-46 percent vs. 51.9 percent). Figure 4 displays the percentage of deliveries that resulted in C-section in 2014, according to the presence and type of preeclampsia/eclampsia. 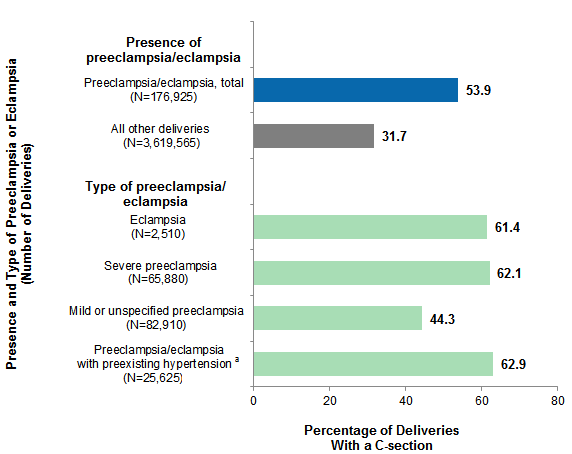 Figure 4 shows the percentage of cesarean sections among deliveries with preeclampsia/eclampsia in 2014 compared with all other deliveries and by type of preeclampsia or eclampsia. Total preeclampsia/eclampsia deliveries: 53.9%; all other deliveries: 31.7%. Eclampsia: 61.4%; severe preeclampsia: 62.1%; mild or unspecified preeclampsia: 44.3%; preeclampsia/eclampsia with pre-existing hypertension: 62.9%. Over half of all deliveries with preeclampsia/eclampsia involved C-section. Among all deliveries with preeclampsia/eclampsia, 53.9 percent were by C-section, compared with 31.7 percent of deliveries not involving preeclampsia/eclampsia. The rate of C-section was over 60 percent for deliveries with a diagnosis of eclampsia, severe preeclampsia, and preeclampsia/eclampsia with preexisting hypertension. In comparison, the rate was 44.3 percent among deliveries with mild or unspecified preeclampsia. Table 4 presents selected coexisting conditions for deliveries with preeclampsia/eclampsia, compared with all other deliveries, in 2014. The conditions displayed were chosen on the basis of prior literature and sorted according to their prevalence among deliveries with preeclampsia/eclampsia. Compared with all other deliveries, those with preeclampsia/eclampsia had a higher proportion of coexisting conditions. Coexisting conditions were more common among deliveries with preeclampsia/eclampsia than among all other deliveries. For example, obesity was a coexisting condition among 17.3 percent of deliveries with preeclampsia/eclampsia but among only 6.7 percent of all other deliveries. Among deliveries with preeclampsia/eclampsia, those with preexisting hypertension were more likely than those with other types of preeclampsia/eclampsia to have obesity (33.2 percent), gestational diabetes (17.1 percent), thyroid dysfunction (6.4 percent), preexisting diabetes (11.4 percent), and cardiovascular disorders (3.8 percent). Anemia occurred more frequently among deliveries with eclampsia (26.7 percent) than among deliveries with other types of preeclampsia/eclampsia (18.7 to 22.5 percent). Similarly, multiple gestations were more common among deliveries with severe preeclampsia (7.4 percent) than among deliveries with other types of preeclampsia/eclampsia (4.6 to 5.3 percent). 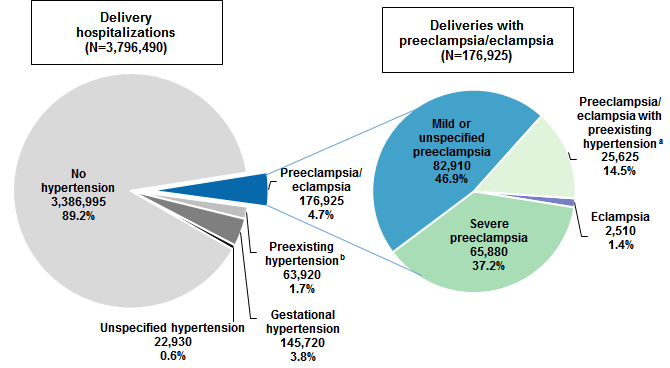 Table 5 presents select outcomes for deliveries with preeclampsia/eclampsia, compared with all other deliveries, in 2014. The conditions displayed were chosen on the basis of prior literature, grouped according to whether they were identified using procedure codes or diagnosis codes pertaining to the mother or infant, and sorted according to their prevalence among deliveries with preeclampsia/eclampsia. b Suppressed because of cell size <11 records. The rates of procedural interventions and adverse maternal outcomes were higher among deliveries with preeclampsia/eclampsia than among all other deliveries. Procedural interventions were more common among deliveries with preeclampsia/eclampsia than among other types of deliveries: blood transfusion was 4 times more common (42.7 vs. 10.5 per 1,000 deliveries), ventilation was 10 times more common (5.3 vs. 0.5 per 1,000 deliveries), and hysterectomy was 50 percent more common (1.6 vs. 1.0 per 1,000 deliveries). Although rare, all the adverse maternal outcomes considered were more common among deliveries with preeclampsia/eclampsia than among other types of deliveries. This included renal failure, heart failure, and peripartum cardiomyopathy. These outcomes were also more common for each type of preeclampsia/eclampsia compared with all other deliveries, even for those with the least severe form of the condition, mild or unspecified preeclampsia. Compared with all other deliveries, those with preeclampsia/eclampsia were more likely to have adverse infant outcomes. Adverse infant outcomes were more common among deliveries with preeclampsia/eclampsia than among other types of deliveries: poor fetal growth (74.6 vs. 25.9 per 1,000 deliveries), intrauterine death (11.6 vs. 6.2 per 1,000 deliveries), and fetal distress (1.8 vs. 1.2 per 1,000 deliveries). Among deliveries with preeclampsia/eclampsia, those with preexisting hypertension or severe preeclampsia had the highest proportion of poor fetal growth (over 100 per 1,000 deliveries). Intrauterine death was most prevalent among deliveries with eclampsia (27.9 per 1,000 deliveries). The estimates in this Statistical Brief are based upon data from the Healthcare Cost and Utilization Project (HCUP) National Inpatient Sample (NIS), 2014. Historical data were drawn from the 2005-2013 National (Nationwide) Inpatient Sample (NIS). CCS categorizes ICD-9-CM diagnosis codes into a manageable number of clinically meaningful categories.22 This clinical grouper makes it easier to quickly understand patterns of diagnoses. CCS categories identified as Other typically are not reported; these categories include miscellaneous, otherwise unclassifiable diagnoses that may be difficult to interpret as a group. The DRG and ICD-9-CM diagnosis codes used to identify delivery hospitalizations—overall and those with preeclampsia, eclampsia, and other types of hypertension complicating pregnancy, childbirth, and the puerperium—are shown in Tables 6 through 8.
a Records with multiple codes were assigned to one category using the following hierarchy: preeclampsia/eclampsia, preexisting hypertension, gestational, unspecified. a Records with multiple codes were assigned to one category using the following hierarchy: eclampsia, severe preeclampsia, mild or unspecified preeclampsia, preeclampsia or eclampsia with preexisting hypertension. a Records with codes for both preexisting and gestational diabetes were categorized as preexisting diabetes. a Definition consistent with measures of severe obstetric morbidity used by Kuklina EV, Meikle SF, Jamieson DJ, Whiteman MK, Barfield WD, Hills SD, et al. Severe Obstetric Morbidity in the United States: 1998-2005. Obstetrics and Gynecology. 2009;113(2 Pt 1): 293-9. Total hospital charges were converted to costs using HCUP Cost-to-Charge Ratios based on hospital accounting reports from the Centers for Medicare & Medicaid Services (CMS).24 Costs reflect the actual expenses incurred in the production of hospital services, such as wages, supplies, and utility costs; charges represent the amount a hospital billed for the case. For each hospital, a hospital-wide cost-to-charge ratio is used. Hospital charges reflect the amount the hospital billed for the entire hospital stay and do not include professional (physician) fees. For the purposes of this Statistical Brief, costs are reported to the nearest hundred. Data on Hispanic ethnicity are collected differently among the States and also can differ from the Census methodology of collecting information on race (White, Black, Asian/Pacific Islander, American Indian/Alaska Native, Other (including mixed race)) separately from ethnicity (Hispanic, non-Hispanic). State data organizations often collect Hispanic ethnicity as one of several categories that include race. Therefore, for multistate analyses, HCUP creates the combined categorization of race and ethnicity for data from States that report ethnicity separately. When a State data organization collects Hispanic ethnicity separately from race, HCUP uses Hispanic ethnicity to override any other race category to create a Hispanic category for the uniformly coded race/ethnicity data element, while also retaining the original race and ethnicity data. This Statistical Brief reports race/ethnicity for the following categories: Hispanic, non-Hispanic White, non-Hispanic Black, Asian/Pacific Islander, and non-Hispanic Other, including American Indian/Alaska Native. For other information on pregnancy and childbirth, refer to the HCUP Statistical Briefs located at www.hcup-us.ahrq.gov/reports/statbriefs/sb_pregnancy.jsp. Fingar KR (IBM Watson Health), Mabry-Hernandez I (AHRQ), Ngo-Metzger Q (AHRQ), Wolff T (AHRQ), Steiner CA (Institute for Health Research, Kaiser Permanente), Elixhauser A (AHRQ). Delivery Hospitalizations Involving Preeclampsia and Eclampsia, 2005-2014. HCUP Statistical Brief #222. April 2017. Agency for Healthcare Research and Quality, Rockville, MD. www.hcup-us.ahrq.gov/reports/statbriefs/sb222-Preeclampsia-Eclampsia-Delivery-Trends.pdf. This Statistical Brief was posted online on April 25, 2017. 1 >140/90 mm Hg on two occasions 4 hours apart. 2 >300 mg/dL on a 24-hour urine protein test, protein:creatinine ratio of >0.3 mg/mmol, or urine protein dipstick reading >1 if quantitative analysis is not available. 3 American College of Obstetricians and Gynecologists. Hypertension in Pregnancy. Washington, DC: American College of Obstetricians and Gynecologists; 2013. 5 Mammaro A, Carrara S, Cavaliere A, Ermito S, Dinatale A, Pappalardo EM, et al. Hypertensive disorders of pregnancy. Journal of Prenatal Medicine. 2009;3(1):1-5. 7 Report of the National High Blood Pressure Education Program Working Group on High Blood Pressure in Pregnancy. American Journal of Obstetrics & Gynecology. 2000;183:S1-S22. 8 Shahul S, Tung A, Minhaj M, Nizamuddin J, Wenger J, Mahmood E, et al. Racial disparities in comorbidities, complications, and maternal and fetal outcomes in women with preeclampsia/eclampsia. Hypertension in Pregnancy. 2015;34(4):506-15. 9Tanaka M, Jaamaa G, Kaiser M, Hills E, Soim A, Zhu M, et al. Racial disparity in hypertensive disorders of pregnancy in New York State: a 10-year longitudinal population-based study. American Journal of Public Health. 2007;97(1):163-70. 11 Report of the National High Blood Pressure Education Program Working Group on High Blood Pressure in Pregnancy. American Journal of Obstetrics and Gynecology. 2000;183:S1-S22. 12 Kuklina EV, Ayala C, Callaghan WM. Hypertensive disorders and severe obstetric morbidity in the United States. Obstetrics and Gynecology. 2009;113(6):1299-306. 13 Mammaro A, Carrara S, Cavaliere A, Ermito S, Dinatale A, Pappalardo EM, et al. Hypertensive disorders of pregnancy. Journal of Prenatal Medicine. 2009;3(1):1-5. 14 Centers for Disease Control and Prevention. Data on Selected Pregnancy Complications in the United States. October 2016. www.cdc.gov/reproductivehealth/maternalinfanthealth/pregnancy-complications-data.htm. Accessed March 29, 2017. 15 Shahul et al., 2015. Op. cit. 16 D'Alton ME, Main EK, Menard MK, Levy BS. The National Partnership for Maternal Safety. Obstetrics and Gynecology. 2014;123:973-7. 17 Ananth CV, Keyes KM, Wapner RJ. Pre-eclampsia rates in the United States, 1980-2010: age-period-cohort analysis. BMJ. 2013;347:f6564. 18 Wallis AB, Saftlas AF, Hsia J, Atrash HK. Secular trends in the rates of preeclampsia, eclampsia, and gestational hypertension, United States, 1987-2004. American Journal of Hypertension. 2008;21:521-6. 19 Kuklina EV, Meikle SF, Jamieson DJ, Whiteman MK, Barfield WD, Hills SD, et al. Severe obstetric morbidity in the United States: 1998-2005. Obstetrics and Gynecology. 2009;113(2 Pt 1):293-9. 20 Callaghan WM, Creanga AA, Kuklina EV. Severe maternal morbidity among delivery and postpartum hospitalizations in the United States. Obstetrics and Gynecology. 2012;120(5):1029-36. 21 The first three categories are defined by International Classification of Diseases, Ninth Revision, Clinical Modification (ICD-9-CM) diagnosis codes for mild or unspecified preeclampsia (642.4), severe preeclampsia (642.5), and eclampsia (642.6). These codes are used if preexisting hypertension was not present. The last category is defined by the code 642.7, which is used if preexisting hypertension was present with preeclampsia/eclampsia. However, records with this code lack detail on the severity of preeclampsia/eclampsia. 22 Agency for Healthcare Research and Quality. HCUP Clinical Classifications Software (CCS) for ICD-9-CM. Healthcare Cost and Utilization Project (HCUP). Rockville, MD: Agency for Healthcare Research and Quality. Updated October 2016. www.hcup-us.ahrq.gov/toolssoftware/ccs/ccs.jsp. Accessed January 31, 2017. 23 Kuklina EV, Meikle SF, Jamieson DJ, Whiteman MK, Barfield WD, Hills SD, et al. Severe obstetric morbidity in the United States: 1998-2005. Obstetrics and Gynecology. 2009;113(2 Pt 1):293-9. 24 Agency for Healthcare Research and Quality. HCUP Cost-to-Charge Ratio (CCR) Files. Healthcare Cost and Utilization Project (HCUP). 2001-2014. Rockville, MD: Agency for Healthcare Research and Quality. Updated November 2016. www.hcup-us.ahrq.gov/db/state/costtocharge.jsp. Accessed January 31, 2017. Internet Citation: Statistical Brief #222. Healthcare Cost and Utilization Project (HCUP). April 2017. Agency for Healthcare Research and Quality, Rockville, MD. www.hcup-us.ahrq.gov/reports/statbriefs/sb222-Preeclampsia-Eclampsia-Delivery-Trends.jsp.